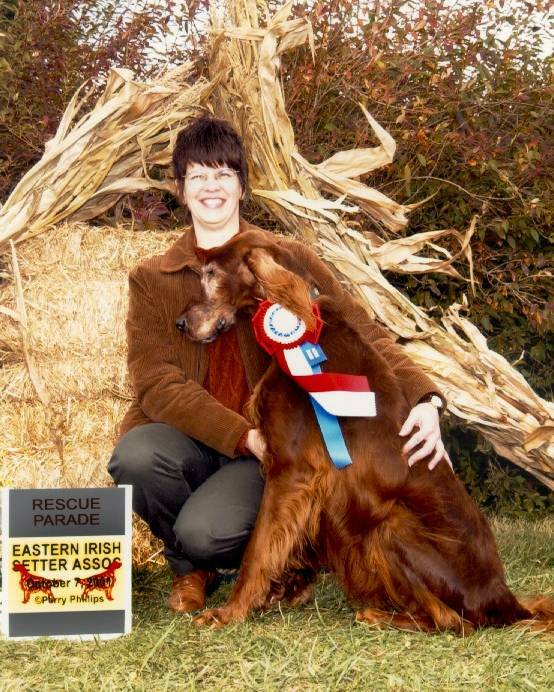 To donate to Irish Setter Rescue click the donate button. Thank you. Hi! We are Rocky and Brandy, two Irish Setter rescue dogs loved by our new owners. We live in NJ and they have given us our second chance. 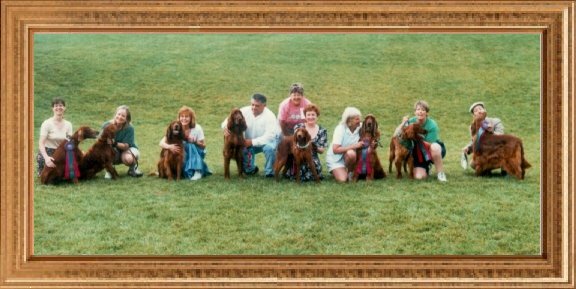 This is us at the Irish Setter Club of America's 1st rescue parade in St. Louis, MO. 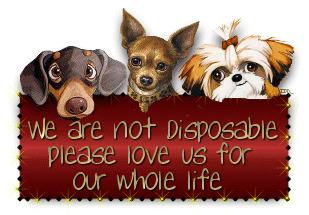 I, Brandy am on the far left and my younger brother Rocky is fourth from the left. It was held in June 1998. We are looking forward to the next one! We love to stay at the hotels! Check out the great ribbons we all got. Photo by Shelly. PayPal eBay's service to make fast, easy, and secure payments for your eBay purchases! Big Pile of Dog Shirts - 10% goes to our rescue - Check it out !!!! Irish Setters available for adoption and rescue stories Irish Setters available for adoption and rescue stories, continued Irish Setter National rescue parades, Lancaster, PA, 2009, 2001 and Jacksonville, FL, June 1999 Brandy and Rocky and Patrick's Christmas Every rescue should have their own couch! What is it with these Irish? Rocky's Christmas 1998 and picture of Mom Happy St. Patrick's Day and Happy Birthday Items to Benefit Rescue A tribute to.... A tribute to pg. 2.... NH19 Success Stories Casey, our Irish Red & White Setter Rescue Reunions, June 2000-2009 Bingo & Gina Our Setters Our Italians Spinoni Fun Day Pooch Parade - High Bridge, NJ My three therapy dogs! The life of two rescue dogs! Patrick saves Tino! Italian Spinone Gina -- missing - 10/6/10 - Photos of our Dogs Be sure to check out our animoto videos Irish Setter application May the luck of the Irish be with you!